Alan DEAR, grandson of Horace DEAR, cycle manufacturer provided details of his family back to John DEAR, born 1836. Bob DEAR provided details of an earlier generation of DEARs including his ancestor, John DEAR, a fisherman of Chiswick in the late 1700s. David DAUBNEY added details of a branch of the DAUBNEY branch that settled in the USA in the early 1900s. Peter SALISBURY provided information about Elias DEAR (1898 - 1972) who emigrated to Australia in 1914; Carol LAKE added details of his descendants in Australia. Dave PADBURY added information about JOHN Dear who was born in 1836. Celia COTTON (webmaster with no DEAR ancestry) noted The British Newspaper Archive website (Morning Post Tue 03 Sep 1839) contains a reference which may relate to Bob DEAR's family: 'John Dear, a fisherman, residing at Brentford, stated that he was bred and born a fisherman' . A composite family tree shows all branches of the DEAR family. Dad was Cyril DEAR of 22 Boston Manor Road. Grandad was Horace DEAR. Grt g dad was cycle maker in High St just along from Rattenburys, later to become car dealer. 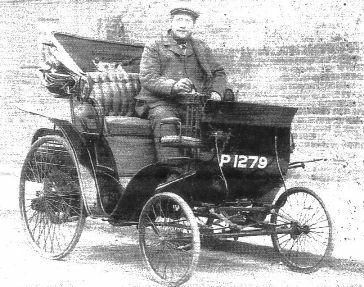 Thomas DEAR the cycle maker later ventured in autos, see b/w photo of him in a motorized carriage ,it may be an early Daimler or de Deion reg no P 1279 which is a Surrey registration. We also have a photo of another venture he dabbled in, a 30 seater charabanc with him and his father standing by it outside the Duke of York on the Gt West Rd with a full load of people, all male, probably off to "Sowfend"" for the day. Now this next bit has also been verified by my 2 cousins of Ivy, dads sister. Dad was born in 1929 and when he was a boy sunday afternoon was spent at Thomas's house behind the cycle shop for family tea. His wife used to hold court always dressed in black like Queen Victoria , children never spoke unless spoken to. The men would gather in the yard at the side in their bowler hats, long coats, starched collars and smoke pipes or cigars, and talk mens stuff of that time. One of Thomas's brothers, went to USA to seek his fortune this bit confirmed by Ivy] got in with the wrong crowd, started bootlegging booze !!! ,got chased to other states by [F B I ?] got caught, sent back here, and at some point, either before or on arrival home ordered a car called a Graham Paige [I'm a petrol head and these cars were the Rolls of America ] he had it shipped home to Brentford. Dad said when it was driven along the High St people would think royalty had arrived, when it was parked in the yard, kids would peer thru the cracks in the wood at this local marvel. Dad said the mens bragging point would be " the first American car to be shipped to England " and homed in Brentford. The following tree is built from the information from Alan coupled with searches of FreeBMD, censuses, parish records on ancestry.co.uk and trade directories plus details from USA descendant, David DAUBNEY. Whilst it looks plausible, purchasing certificates would help prove the line. As an example of circumstantial evidence, the family includes a Hugh DEAR born in 1870. He is the only person of this name whose birth was registered in the 1869 - 1872 period. The only Hugh DEAR I could find in the 1901 census of the right age was a patient in an infirmary on the Isle of Wight, he was born in Brentford, so fits perfectly. The census shows he was married and an omnibus conductor. There is a marriage in Fulham of a Hugh DEAR in 1896 in Fulham - not far from Brentford. His wife was either Phoebe GULLIVER or Rose Mary GULLIVER (sisters?). The 1901 census shows a Phoebe DEAR living in Fulham with a two year old son Hugh - Hugh senior's wife? Her marital status was originally written 'Widow' but this was crossed out and changed to 'M'arried - perhaps she was not sure if he would survive his hospitalisation. Phoebe had a visitors, an Edith SMITH and three children; Edith is possibly a sister to Phoebe as they are both Wiltshire born. Perhaps Edith was there to support her sister? The final piece in the puzzle is the death of a Hugh DEAR in Fulham in 1908 aged 30. So it looks as if he recovered sufficiently to return home from the Isle of Wight but died seven years later. TB? My earliest known DEAR ancestor was John DEAR, a Thames fisherman in Chiswick in the late 1700's. He married Ann WALTERS there in 1792 and moved to Brentford. The records for his brother, Charles, spell the name as DEER, so there are possible connections within all the name variants (DEAR, DEARE, DEER, DEERE). John and Ann's son, my 3g/grandfather Thomas DEAR, also a Thames fisherman, was born in 1809 at Old Brentford, Ealing, Middlesex and lived there until after the 1881 census. His wife was Rachel BRUCAS and, according to census information, she was also born in Ealing, Middlesex, in about 1812-13, although I cannot find a baptism for her in St Mary's Ealing records. This baptism at St Mary's Ealing is unusual because after 1828, I believe baptisms of those born in Old Brentford were performed in St George Old Brentford, Parish of Ealing. The first date is the date of birth and the second is the date of baptism. 1830 21/8 3/10 Rachel d of Thomas & Rachel DEER, fisherman, Old Brentford The entries below were recorded from the registers of baptisms in St George Old Brentford, Parish of Ealing held at the GLRO (now the LMA), London. Rachel Wife .. Female 38 Charwoman .. .. ..
Rachel Daug Un F 20 Needlewoman .. .. ..
John Son Un M 14 Scholar .. .. ..
Eliza Daug Un F 12 Servant .. .. ..
Henry Son Un M 10 Scholar .. .. ..
Ann Daug Un F 3 .. .. ..
Rosa Daug Un F 4 months .. .. ..
My direct ancestor, Thomas, was not at home. He was aged about 17 at the time and probably living and working somewhere else. Eliza in the census, aged 12, is not the Eliza Susannah in the baptism records. Eliza Susannah would have been about 19 but I suspect she died in infancy. I have read that it wasn't unusual then to use the same name again in a family. I have gathered my information from St Mary's Ealing parish records, St Nicholas Chiswick parish records and census records. From the latter I have learned that my DEAR ancestors lived in Brook Lane, Bull Lane, High Street, Front Street, Running Horses Yard, Half Acre, The Alms Houses as well as Pottery Road in Brentford. There is a baptism of a John DEAR in 1836, younger brother to Thomas baptised 1834, at the same church: St George Old Brentford. Thomas DEAR senior is a fisherman in 1836, as in 1834. It seems likely that this John DEAR bn 1836 is the person who heads Alan Dear's family tree: he named his eldest son Thomas and was born in the right place at around the right time - not conclusive evidence but it is suggestive that this is the correct baptism. I think it is very likely that Rachel was baptised at the same church in 1812: using your ancestry subscription you should be able to browse the parish record for this year (the baptismal entries pre 1813 are not indexed as yet). The father's forename could also explain the instances of Elias occuring as a DEAR family forename in the 19th century. Finally, Elias and Rachel BRUCASS witnessed Rachel junior's marriage in 1830. Edna A DEAR (1915 ): married Frank SNELLING; Alan adds they were "both living at 22 Boston Manor Rd from late 50s to their deaths. I don't know his d o b or if he was Brentford born. He did play football for Brentford F C for a short time,and then he was a builder for a co called Frank TUCK,who were based Brentford / Northfield border." Elizabeth DEAR daughter of John DEAR married Henry Thomas DAUBNEY. They had 4 sons. Henry, Claude, James, Leslie. Henry Thomas DAUBNEY got a job taking care of horses for Alfred Gwynne VANDERBILT in Newport Rhode Island USA. This was the Vanderbilt that went down on the Lusitania. The ultra rich of the time participated in a sport called Coaching in which they would drive a 2 or 3 day predetermined course stopping at Inns along they way. Many times, these rich men would dress as coach men and drive the coach themselves. There has always been a rather vague family story as to how Henry Daubney met Alfred Vanderbilt, but now that I have learned of this sport of Coaching, it would appear most likely that they met during one of these Coaching excursions. It fits the family story that they met out on a roadway while driving coaches. Henry, Elizabeth, and all 4 sons came to the US at different times between 1910 and 1920 and settled in Massachusetts and Rhode Island. Henry Thomas DAUBNEY was my great grandfather and needless to say, with 4 sons to continue the name I there are more relatives than I care to imagine. Should anyone doubt the story of Henry Thomas DAUBNEY working for Alfred Vanderbilt I would suggest they check the Ellis Island website. If you search for Henry DAUBNEY you find two entries for my greatgrandfather and the ships manifest states his ticket was paid for by "Mr Vanderbilt". My great grandparents Henry and Elizabeth came through Ellis Island, as did my grandparents Henry and Ethel Culley DAUBNEY (of Malvern Rd. Kilburn), and my grandfather's three brothers Claude James, and Leslie. My father Henry also came through Ellis Island as a child. I have more info on a daughter of John DEAR: Betsy DEAR married a man named Jack HEATH. They had eight children; Jack, Ivy, Thomas, Beatrice, Una, Percy, Lillian, Cyril, and Annie. Annie HEATH emigrated to the US and lived with her aunt Elizabeth Dear DAUBNEY in Rhode Island. After a period of time she married Claude DAUBNEY, one of the sons of Elizabeth Dear DAUBNEY and Henry Thomas DAUBNEY. This was a marriage of first cousins. Claude DAUBNEY was for many years a butler for rich families in Rhode Island. Around 1940 he was a butler for another VANDERBILT who was the Governor of the State of Rhode Island. This VANDERBILT, after an election defeat, was activated as an officer in the US Navy during WW2 and Claude found himself unemployed. Elias DEAR seemed to be a Territorial of some sort and at the outbreak of The Great War he joined the 8th Middlesex Regiment. Unfortunately Elias W Dear was killed in action on the 23rd April 1915 at a place called Zonnebeke in Belgium. He has no known grave but his name is listed with thousands of others on the Menin Gate. See a photo showing the inscription. His name is also listed on the Brentford War Memorial and the Brentford Gas & Coke Company Memorials which are both sited next to the Inverness Lodge. 16 Year old Elias Bowles DEAR (see above for how he fits into the DEAR family tree) seems to have emigrated to Australia on the SS Norseman, which left London for Melbourne in January 1914. Aged about 18 in July 1916 Elias joined the army, (the Australian army that is!!!) and sailed for England in October 1916. Elias was badly wounded during the course of his service in France and Flanders and was eventually returned to Australia where he was to remain for the rest of his life. Elias married a Vera Loveday WARREN in 1920. You can view a copy of Elias Bowles Service record for free at this link: National Archives of Australia: search for Family Name 'Dear' and choose Category of Records 'World War 1'. Part of the summary is pasted below. And the units Nominal Roll here: Australian War Memorial : choose the 'People' tab.